Friendly, helpful reception. Excellent breakfast. Room very small. I had the friendliest welcome I have ever had coming to a hotel. I felt like an old friend coming for a stay. Thanks for lifting the spirits of a tired traveller. I booked the smallest room in the property and it was more than adequate for a overnight stop. Comfortable, warm and very clean. The only fly in the soup was someone who probably got lost and tried opening my door at 2am and then appeared to have a long conversation in the corridor. Where to find Lund hotels near an airport? Where can I find hotels in Lund that are near tourist attractions? If you're seeking affordable or upscale lodgings in or near Lund, it's good to know that there is a wide range of different possibilities. Spend some time exploring Expedia's 21 hotel options, which are all within a 0.1-kilometre (0.06-mile) radius of Lund's center. 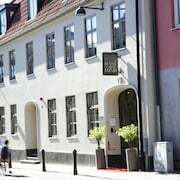 A secret to trouble-free vacationing is booking a room that's close to the action, so why not check out the latest offers at the Grand Hotel - Lund and The More Hotel Lund, which you'll find within 1 kilometre (0.6 miles) of Lund's city center. 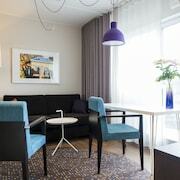 If you are a budget traveler and are looking for more affordable Lund accommodation, our hotel database has affordable places to consider in the vicinity. 2 kilometres (1 mile) away from Lund's center you'll find the Scandic Star. The Hotel Djingis Khan is just 2 kilometres (1 mile) away. Two more options at the lower end of the spectrum in Lund include the Elite Hotel Ideon, Lund and the Check Inn Bed & Breakfast. 17 kilometres (10 miles) away from downtown Lund, is the The More Hotel. 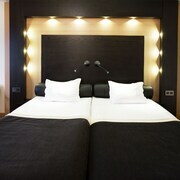 The Master Johan Hotel, BW Premier Collection is positioned 16 kilometres (10 miles) away. 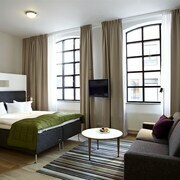 Two other accommodation options in this area are the Scandic St Jörgen and the Angavallen. Once you have really explored Lund, why not explore a little further afield? The Southern Sweden area has many things to offer visitors. Check out Southern Sweden's old towns and historic palaces or admire its forests and lakes. In this section of Sweden tourists can enjoy snowboarding. 16 kilometres (10 miles) to the northwest of Lund you'll find Loddekopinge, where visitors can enjoy Lodde Center and Barseback Beach. 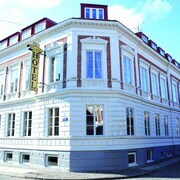 The Barsebäcks Vandrarhem and Dahls Hotell are a few of the hotel and apartment options in Loddekopinge. Or, you could consider staying in Skanor, 40 kilometres (25 miles) to the southwest of Lund, where you'll find the Skanörs Gästgifvaregård and Norregård Hotel & Konferens. If you're staying in Skanor, set aside some time to check out the Falsterbo Beach and Skanor Beach. For those choosing to fly, Sturup Airport is the preferred airport for Lund. 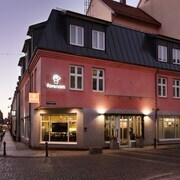 A hotel that is nearby is Nötesjö Hotell. 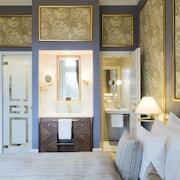 What are the most popular Lund hotels? Are there hotels in other cities near Lund? What other types of accommodations are available in Lund? Explore Lund with Expedia.ca’s Travel Guides to find the best flights, cars, holiday packages and more!